On Tuesday night, my brother and his wife welcomed their little baby boy - Q-bert*, into the world. I left work early yesterday to pick up the girls and head over to pick up my sister and go to the hospital to see our new little guy. The girls were pretty in-different to the baby, but I love him. He's all curled up in a ball because he doesn't know to stretch out yet, he makes adorable faces in his sleep, he wiggles and squirms and I can't wait for him to grow and change and see what his personality is like. He has blue eyes (for now) and a head full of dark hair. He slept most of the time we were there, and I hope he keeps that up for the next week to give his mom time to recover and really enjoy him. Photos coming soon. 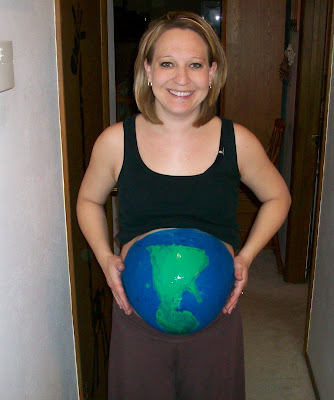 Last week my cousin, C, painted her very pregnant belly for Earth Day, today she gave birth to her own little baby boy. I can't wait to meet him!